It’s been a while since someone caricatured us with skill, and made it funny without being trite. Tamasha in Bandargaon has brought R. K. Narayan-esque humour back. And after the downtrodden man theme that has so obsessed contemporary Indian writing for the last half a decade, the absurdities of the lower middle-class Indian are a breath of fresh air. In a fictional suburb in Bombay, Bandargaon, hilarity and love rise from the seediness of the local underground gambling den and the self-righteousness of its educated citizens. Bandargaon has its own newspaper called the Bandargaon Observer that records the lives of the people with a keen moral eye. Slum and town lie side by side, and respectable citizens and their lesser flunkies drink tea at the same stall. Tamasha in Bandargaon book cover. Shalini plays the girl next door who veers between the straight-laced Vinayak and wily but lovestruck Chagan. 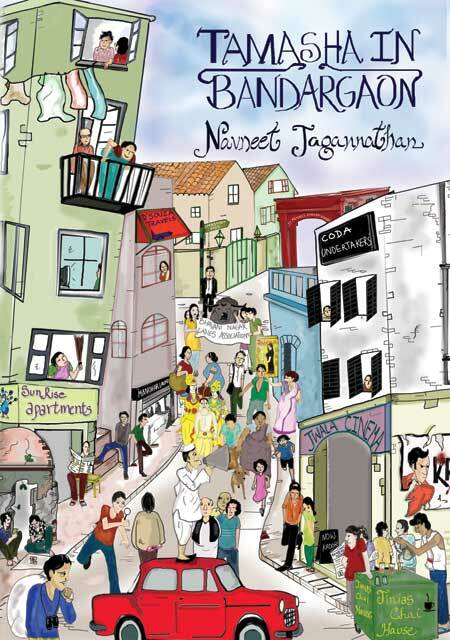 Much like its nearby neighbour Bollywood, Bandargaon witnesses a whirlwind of broken engagements, sabotaged weddings, backstabbing, and jail time to determine who will get the girl. In its midst is the obstacle that stumps all: the fierce Lakshmibai who won’t allow the seven pheras for her daughter until she’s satisfied. Meanwhile, in another quarter of Bandargaon, Anand has the unenviable role of playing the hapless son-in-law to his once-firebrand father-in-law. Sajjanpur’s tyranny over his household is absolute, and there is deadly silence in his house as his prepares for the next election. And when his lucky misprinted two-rupee note is lost by Anand, he gives his son-in-law an ultimatum. He must find the note at the end of a week or less leave the house he has bought for him. And so the adventures continue. The tiny suburb is like a pressure cooker liable to go off at any point. Cramped for space, and fighting for the little elbow space there is in money-making and scaling social ladders, its citizens are constantly embroiled in some mess or the other. Although narrated wryly, his characters are only laughable because they’re people you encounter every day. Beneath the humour is the struggle and ugliness of suburban life. There’s a strained movement towards change; money made on the side, pretend attack-save-appear-hero conspiracies to bring around prospective mothers-in-law, political anger at neighbourhood goons—all these come under the same umbrella of improving their lives. Like most Tranquebar books, Tamasha is genuine and fresh. It’s taken the soap opera that is India and reworked into a readable performance of ridiculous but believable people. Things that could have been said in a manner to provoke outrage or plain sadness have been articulated to provide insight into the possibilities of humour in darker spaces.